It is not easy to find Nuumite. This rare and complex stone is only found in Nuuk, Greenland. It is referred to as the Magician’s Stone or the Sorcerer’s stone because of its powerful ancient energy properties. This stone is black with specks of gold, red or blue. Created from Anthophyllite and Gedrite, it is believed that Nuumite is the oldest mineral on earth. Being next to the earth’s vibration for so long, this stone has a variety of powers that is unlike any other stones. In addition to being the ultimate grounding crystal, Nuumite possesses a strong electro-magnetic field. This feature can ban negative energies that are caused by almost any form of energy. In physical healing, this stone is able to help tissues regenerate and treats diseases of the central nervous system. It has the unique advantage of purifying the body and whisking away infection, diseases of the blood and helping to reduce stress. Spiritually, Nuumite protects against energy thieves that try and subdue your journey to a higher level. Crystal healers believe Nuumite helps in the recognition of the things that are needed in life and aids in the letting go of what is not. Insight and intuition is greatly enhanced and finding one’s inner power is heightened. 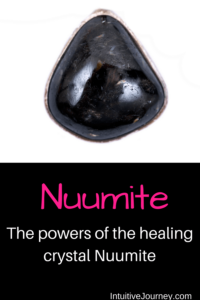 Nuumite is also able to create an atmosphere for emotional healing. It is a great teacher of honor and respect and strives to lead you to your subconscious to address hidden pains and depressions that have been holding you prisoner. Once the power of self-mastery is understood, you are able to see the present with clarity and importance. The past will be dissolved and gnawing, unimportant material problems will become just that. When searching for Nuumite, make sure of its origin so that you can gain as much power physically, mentally and spiritually as you can. There has been talk of finding Nuumite in Canada and the United States, but the most powerful species is only found in Greenland. Keep this stone near you and incorporate in your meditation to better balance all of the chakras. If you liked this post, please “PIN IT”!